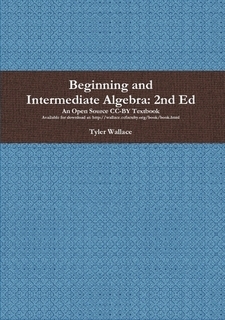 Beginning and Intermediate Algebra by Tyler Wallace is licensed under a Creative Commons Attribution 3.0 Unported License. Based on a work at http://wallace.ccfaculty.org/book/book.html. To download a modifiable verison of the text, solutions manual, powerpoints from videos or workbooks click here.